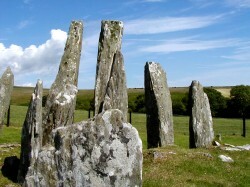 There are many web sites featuring the big players of the stone circle world such as Stonehenge, Callanish, Ring of Brogar and Avebury to name a well-recognised few. And while sites like these are truly outstanding in their own right there are also literally tens of thousands of lesser stone circles, single standing stones, local named stones and other ancient stones, many of which are forgotten by most and only seen by a dedicated few. This web site is about those forgotten stones, lying in out of the way places and just waiting to be discovered. At first I thought there would be few stones or circles worth looking for in my local patch in the South of Scotland but when you get down to it and study the maps, you can sometimes find real surprises and my initial count revealed over 400 potential locations to visit. My search was not restricted to the classic standing stone shown on Ordnance Survey maps but also other stones such as named stones with Wallace’s Putting Stone being a good example and boundary stones, such as those found along the Scottish/English border in the high Cheviots and also some of the "stone related" locations such as sacred hills, glacial boulders and so on. I started this web site by purchasing all the new Explorer 1:25,000 series Ordnance Survey maps of the region and painstakingly studied them, marking each possible stone or circle in pencil, then listed them in the web site database. Originally I did not restrict my search to only the Scottish Borders and the Lothians but also ventured over the border into Northumberland. However, the project soon became too unwieldy and I decided to create four main areas for now, the Scottish Borders, the Kingdom of Fife, The Lothians and recently, Dumfries & Galloway. With so many sites to visit and photograph it will take some time to complete this site and I also suspect it will never be truly complete as more stones are found and added. Plenty to be getting on with. I'd also like to point out that some of the sites included are not strictly within the regions listed above. For example, some sites across the Border in Northumberland may be included within the Scottish Borders section. Ancient stones found in around Stirling might be found in the Kingdom of Fife section, and so on. As well as ancient stones of recognised antiquity I've also started to include many of the named stones and rocks found along the coastline of the region. The easy part is tracking down the stones themselves, taking photographs and doing the web site is also easy. What is really the difficult part is researching each of the sites, finding out a little bit of history or interesting information, how it came to have the name it has and so on. This is where you can help. If you have a book on standing stones, see if there are any of the sites listed here in the index and please do send in anything that might be of interest and could be added to the site entry. Finally, never forget what it feels like to suddenly come upon that special stone, the one you have been searching for all day long. Make every stone be like the first one. 007 Cairnholy I, Kirkdale, Creetown. Copyright © 2001 - 2008 Gary Buckham. All Rights Reserved.